One of the things that I like the most about art blogging is the network of like-minded artists that you collect. All the fellow sketcher’s blogs out there are tremendous motivation for me. The constant stream of new art keeps me engaged – always seeing new ways to go at things, maybe pick up some tips and tricks. I recently met Montreal artist/designer/educator Shari Blaukopf through her sketch blog at http://shariblaukopf.com/ where she’s taken on the Sisyphean task of a *daily* sketchblog. I consider myself obsessed with art – but I’m leery of committing to a daily. That’s quite a challenge! 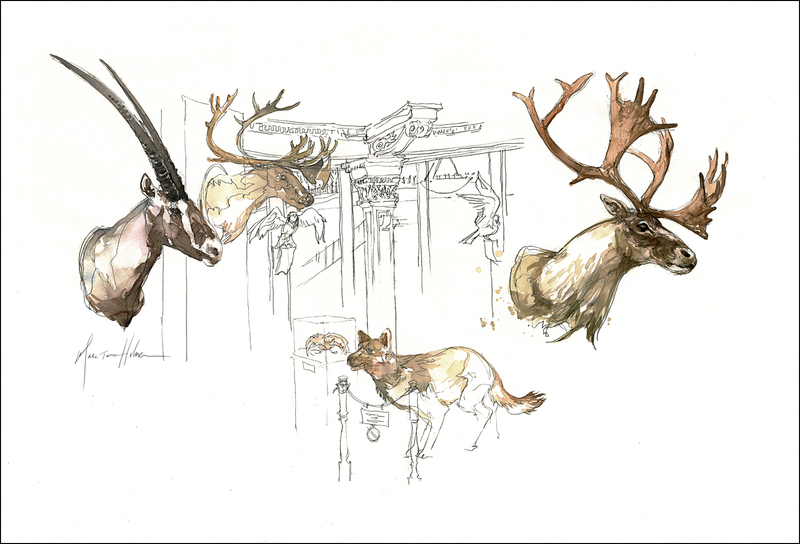 Check out her deceptively light sketches. They look simple at first – but they’re so casually perfect, you can tell she’s got the designer’s eye for composition, as well as the painter’s touch for mark making. We decided to hit McGill’s Redpath Museum for an afternoon of sketching. Sketch artists socializing is quite a funny thing. We get together for the purpose of ignoring each other for 20 minutes at a time. Whatever works I guess. Even anti-social art types like to hang out :) It’s always neat to see the other person’s version of a place. The Redpath is a kind of museum they just don’t make any more. The Victorian idea of the Cabinet of Curiosity inflated to a whole building. There’s everything from Japanese armor to Dinosaur skeletons crammed into one large room. My favorite thing is the taxidermy animals. This is essentially a creepy thing – having a wolf just sitting there in your living room. At least these ones are fairly sedate – no dramatic recreations of predators pouncing on prey. Worse luck! I found myself enjoying the way this poor wolf was held back by a little red rope, eternally watching the caribou go by. When I’m rich and famous I’m going to fill the house with taxidermy animals. Don’t tell Laurel – we’ll just add a few at a time. Maybe she won’t notice.